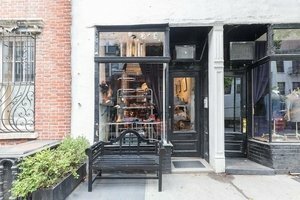 This charming retail boutique is nestled in the charismatic West Village. This space is in a convenient location, and it includes many subway options nearby. It is perfect for a Pop-Up Store, Product Launch or Private Sale. This space has an attractive frontage with a prominent window display that draws in passersby in this bustling area of Manhattan. It also includes a sidewalk marque style sign that can help publicize your pop-up. The interiors are comprised of white walls, carpeting, a lovely chandelier and fairy lights that create a warm vibe. The space is fully furnished for retail with shelving, furniture, a bathroom, sink and fridge, internet, iPad, Bluetooth sound system, and a stock room. All the furniture is available, the space comes as is. Situated in the popular area of the West Village, this space is in a prime location. It is an exceptional opportunity in a sought area and great for brands and designers to connect with customers and expand their reach with a pop-up store or retail event. Space is only available after 6pm.